This is a minimally invasive procedure requiring a general anaesthetic. The operation takes place through small incisions on your abdomen, 0.5-1cm typical size, through which gas is inflated in order to create space and make internal organs easy to see. A tiny camera (laparoscope) is then inserted into the abdomen guiding the insertion of further specialised laparoscopic instruments which are used to perform the repair. 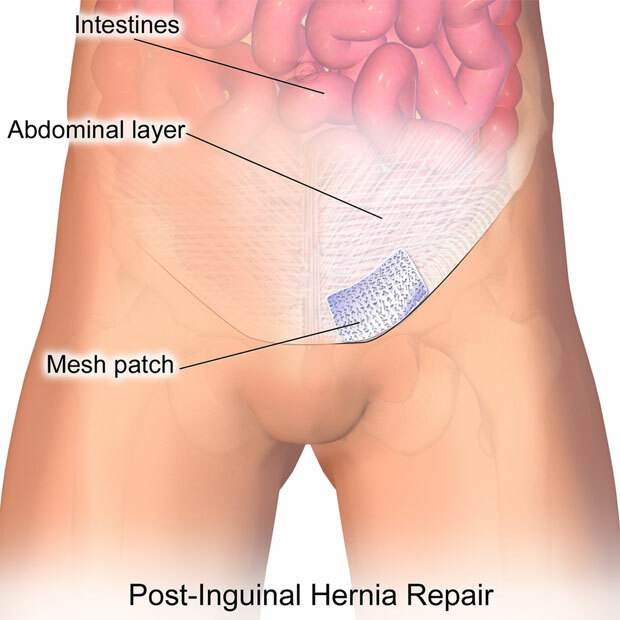 A synthetic mesh is then fixed in place to support the hernia defect in the abdominal wall. Sometimes after the repair of a very large hernia a small drain may be left in the previous hernia cavity to prevent the build up of fluid. This is removed after a few days. Laparoscopy also allows the surgeon to repair a recurrent hernia avoiding previous scar tissue from a previous open repair and it is the number one choice for repairing inguinal hernias in both groins at the same time. After the procedure you will wake up in a hospital room. Laparoscopic hernia repair is normally performed as a day case operation but sometimes patients may need to spend a night in hospital. You are typically expected to go home once you are eating and drinking, are able to manage the pain and walk unaided and have passed some urine. It normally takes about two weeks to fully recover from a laparoscopic inguinal hernia repair and return back to work but it varies from person to person and depends on the type of hernia repaired, the person’s general health and the nature of their work. You should avoid any heavy object lifting or strenuous exercise for at least 6 weeks to reduce the risk of the hernia coming back. A laparoscopic hernia repair performed by an experienced laparoscopic surgeon has a similar rate of complications compared to an open procedure and is normally reasonably safe. These include complications common to all surgical procedures such as infection, bleeding, blood clots, heart problems, pneumonia, risk of injury to internal organs, urinary retention, anaesthetic risks and complications specific to inguinal hernia repair operation such as injury to the spermatic cord, hernia recurrence and chronic pain. The risk of chronic pain is reduced with laparoscopic surgery and further reduced in laparoscopic inguinal hernia repair by our use of a special mesh that does not require fixation onto the abdominal wall. Open procedures involve the use of either local, regional (spinal) or general anaesthesia. A skin incision is made over the hernia, the protruding tissue is reduced inside the abdomen and a combination of stitches with the insertion of a prosthetic mesh is used to reinforce the weakness and repair the hernia. Recovery after an open hernia repair is slower and may take a number of weeks before you can return back to normal activities.